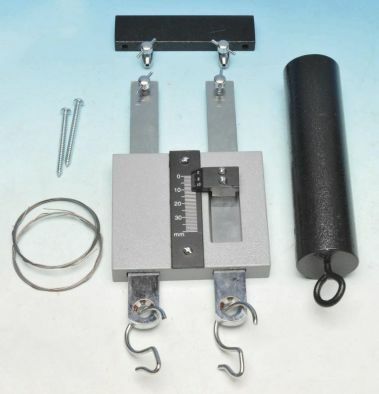 Consists of a scale plate carrying a 0 to 30mm scale and a movable vernier readable to 0.1mm precision. Both have bars with clamping screws for the wires and hooks for the tension weight and loading masses. A ceiling clamp is provided for the upper ends of the wires, together with a pair of large wood screws for attaching it to a convenient overhead beam, door frame etc. A tension weight, mass 1.3kg approx., for the comparison wire is also included. (No load masses or wires supplied).